Bounded by the Severn, the Wye and rural Herefordshire, the Forest of Dean’s water and woodland makes for a magical place to camp. With goshawks whizzing through the branches of tall trees, wild boar and deer snuffling in the undergrowth and bluebells carpeting the floor in spring, it can feel timeless. But it’s also a place of adventure and activity with walking, mountain biking and kayaking fantastic ways to explore. We’ve brought together the best places for camping and glamping in the Forest of Dean to help you explore this tempting part of Gloucestershire. The Forest of Dean covers more than 35 square miles of rural Gloucestershire. It’s a mixed woodland that was once a royal hunting ground protected for the king. Now it’s more of a playground offering ample opportunities to get outside and enjoy the fresh air. It's criss-crossed with footpaths, cycle routes and bridleways and, with the beautiful Wye gorge and river on one side, it’s also a great place for taking to the water by kayak or canoe. In short, it’s one of the best places in England for outdoor adventure making camping and glamping the go-to ways to stay. The best campsites in the Forest of Dean are those which help you make the most of this special location. Some are close to the water and some have footpaths and cycle tracks directly from the campsite gate. Some have scenic locations or are close to attractions you might want to visit. We look for something special in all the campsites we choose to feature on Cool Camping, but that 'something special' is not always the same thing. Are you a camper with your own tent? Or a glamper with a longing to make your holiday in the great outdoors a bit more comfortable? Campsites in The Forest of Dean offer both. 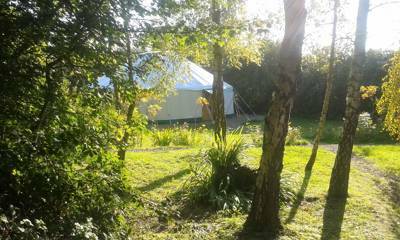 There are places where you can PYO (pitch your own) and places where a safari tent, yurt or bell tent will be pitched for you. But these days, of course, glamping is not just confined to tents, it can also mean a shepherd’s hut, treehouse or glamping pod. It can even mean hairdryers, fluffy towels and a hot tub – the sky is the limit when it comes to luxury. Here at Cool Camping, we find it tough to choose between the two so we don’t. Instead of looking for a single type of camping or glamping, we check them all out but only give the thumbs up to place that we think offer something special – whether it be a fab location or four-star luxury. That means that among our collection, you’re as likely to find a basic pitch on a tents-only site as a fairytale treehouse with all mod cons. Classic camping where you pitch your tent among the trees, by a river or in a sunny meadow is an incredible way to spend time in the Forest of Dean. You can hear the birds and the bees through the canvas and watch the silhouette of leaves dancing on the tent when you wake up. You only need unzip the tent to feast your eyes on the Gloucestershire scenery and, if you’ve chosen wisely, can probably pull on the hiking boots or hop straight on your bike to get out and explore your surroundings. 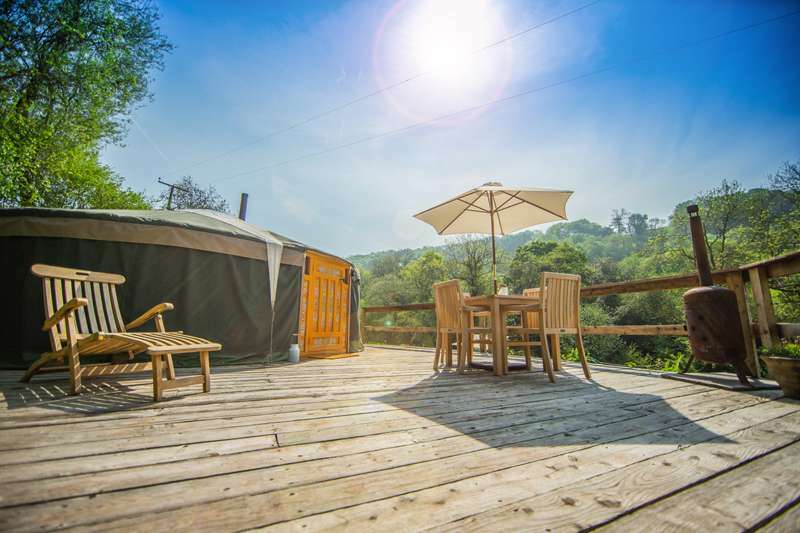 But if you haven’t got the gear (or the energy), glamping is a great way to stay. You still get to immerse yourself in the scenery – but your bed is likely to be more comfy, you won’t have so much to pack and you can start enjoying yourself as soon as you arrive. It would be hard to imagine a better place for a family holiday than The Forest of Dean. This is a place that’s said to have inspired Tolkein’s Lord of the Rings and JK Rowling’s Harry Potter – and some of the scenes for the film of The Deathly Hallows were shot here too. It’s not the only filming that’s taken place in the area either. Star Wars and Doctor Who have both found locations in the area. But if you and your kids can’t feel the movie magic, perhaps the chance to see the wildlife will inspire you. There are deer, wild boar and birds everywhere – not to mention plenty of trees to climb, of course. And if your kids can’t sit still, you’ll find plenty of ways for them to burn off energy - from family-friendly cycle routes to tree-top adventure trails. The range of activities mean there’s something for kids of all ages too – as well as a range of attractions that are suitable for families (more on those later). Whether camping or glamping, as beginners or experts, you’re likely to find that life in the great outdoors goes down well with the kids. It’s our experience that kids love camping in all its forms from the most basic of campsites where even putting up a tent is part of the adventure to high-end glamping where you stay somewhere with pint-sized proportions. There are campsites which are built with kids in mind, places with playgrounds and kids clubs, but often these are the commercial sites we try to avoid. But just because a site doesn’t have cartoon characters and sweet shops doesn’t mean it’s not child-friendly. Just as kids often find the cardboard box at Christmas more enthralling than the present inside, the best campsites for kids are not always the ones that shout the loudest. Sometimes the sticks, the stones and a little imagination make for the best toys and playthings. And don’t forget the sociable side of camping. Your kids might well have made friends before you’ve even unloaded the car. An Iron Age hill fort at Symonds Yat and Roman remains within a country estate… the history of The Forest Dean goes back a long way. But the more recent history is that which has shaped what you see today. And by more recent history, we’re talking about the last thousand years. It was soon after the Norman conquest of 1066 that the Forest of Dean was declared a royal hunting ground. Wild boar and deer were hunted and on the menu for generations of kings with verderers appointed to stalk the place on behalf of the monarchy. Grazing rights, which still exist today, were established in the 13th century. It was also around this time that wild boar were hunted to extinction in the forest – and across Britain. In the 14th century rights were given to people living in certain parts of the forest to mine the area – and iron ore and coal were mined for centuries to come until 1965. Freeminers rights are technically still in place and you can find out about the history of mining at Clearwell Caves which are open to the public. The forest was also a great source of timber for Tudor war ships. It was in 1938 that the Forest of Dean was declared a National Forest Park. The designation more for promoting natural beauty and outdoor leisure than conservation. Up until 1971, the land belonged to the monarchy and as such was called The Royal Forest of Dean. Now it is in public ownership and managed and looked after by The Forestry Commission. It’s the trees, of course, that make the Forest of Dean what it is – but the flowers, insects and wildlife that live in and around them are an important part of the woodland too. Visit in springtime and you can see beautiful spring flowers. First there are the daffodils. Their amazing display at the end of March around the three villages of Oxenhall, Kempley and Dymock have given rise to the collective name, “the golden triangle”. You can follow The Daffodil Way, a 10-mile circular walk, to see some of the best of them. There are also see great displays of daffodils in the formal Lydney Park Estate gardens. Later in the year, usually in May, bluebells carpet much of the woodland. A great place to see them is under the trees surrounding Cannop Ponds – where you can also watch mandarin ducks. If you’re camping in the Forest of Dean for the birdwatching opportunities, you’ve chosen a good spot. It’s one of the best places in the UK for seeing the elusive goshawk. Symonds Yat rock on the River Wye is one of the birding hotspots and it’s also a great place to watch other birds of prey, including peregrine falcons. RSPB volunteers are on hand at the viewing point from March to September to help visitors spot birds and answer questions. The woodland canopy is home to the usual array of woodland birds while the undergrowth provides hiding places for woodland mammals including the Forest’s famous (or perhaps that should be infamous) wild boar population. In medieval times wild boar were present here but became extinct in Britain in the 13th century. It wasn’t until the 1990s when some wild boar escaped (or were dumped) in the area, that they returned. Fallow deer and the occasional roe deer can also be spotted here alongside the free-roaming sheep, which belong to “ship badgers” or local shepherds with ancient grazing rights. There are also badgers, foxes and smaller mammals including voles as well as a large population of bats. 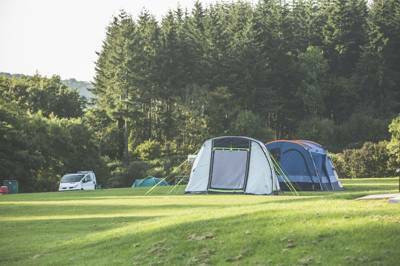 Camping is the perfect partner to the outdoor activities that The Forest of Dean is famous for. If you’re hoping for an active, outdoor holiday, bring bikes, walking boots or kayaks along with the tent and check out some of the top places for outdoor exploration. If you haven’t got the bike or roof rack to bring your own gear though there are plenty of places to hire equipment and even join in with organised outdoor pursuits. Cannop Cycle Centre is one of them. If you want to explore on two wheels, take advantage of its bike hire, café and trails for all levels from family friendly to challenging mountain biking routes. If you prefer exploring on your own feet, grab an OS Map and make up your own route or follow one of the walking trails from the Forestry Commission’s centres. For longer distance hiking, how about joining a section of Gloucestershire Way or Offa’s Dyke Path? For kayaking or canoeing, head for the River Wye. Paddling through the Wye Valley is one of the best ways to see the scenery and there are plenty of kayak hire places. Many of them double up and also offer climbing courses in the gorge. And, for a tamer experience in the trees, you can head instead for Go Ape’s treetop adventure trails in two locations; Mallards Pike or Beechenhurst – where there’s climbing for kids. The Forestry Commission’s main visitor sites in the Forest of Dean are a good place to get information and set out on your exploration of the area. Head for Beechenhurst in the heart of the forest to start with. There’s a sculpture trail, play area, café, and tree top adventure trail for kids. Symonds Yat Rock has walking trails, a cycle route, is renowned for its views, climbing and bird watching too. The Dean Heritage Centre is a good place to head for if you want to learn more about the Forest of Dean – or if you’ve got Gruffalo-obsessed kids as the centre has a diverse mix of attractions in one place. There are five museum galleries, a Victorian cottage and a charcoal burners’ camp – as well as outdoor attractions including a Gruffalo woodland walk. You can see the 12th-century St Briavel’s Castle, once the administrative centre of the ancient forest, from the outside (it now houses a youth hostel) or visit the well-preserved and spectacularly-situated medieval Goodrich Castle at Ross-on-Wye. There’ even older history among the Lydney Estate which has Roman ruins among its beautiful gardens. The Dean Forest Railway runs just under five miles through countryside and woodland from Parkend in the north to Lydney Junction in the south with several stops along the way. The railway’s Norchard station has a museum, café and locomotive shed – as well as riverside walks. From Lydney Junction at the end of the restored line you can follow the old trackbed to get to Lydney Harbour on the River Severn. Another attraction that has an appeal to all ages is Clearwell Caves – a system of caves and caverns below the forest that have been mined for iron ore and ochre for thousands of years. There’s also the International Birds of Prey Centre – with 12 acres, 250 birds of prey and daily flying demonstrations to see. The centre is on Newent – not far from the Three Choirs Vineyard. Three Choirs is one of England’s oldest vineyards and with tours and tastings available several times a week. For more ideas of things to do when you’re camping in The Forest of Dean, check out the area’s official tourist information website. Forest of Dean Wye Valley Bracelands campsites camping woodland forest and wye Whitemead Forest Park at Best campsites in the Forest of Dean, Whether it's pitching on the riverside or woodland camping in the forest, discover the best campsites in the Forest of Dean area with this hand-picked collection from the authors of the Cool Camping guidebooks.